The recent gains don’t seem transitory either. 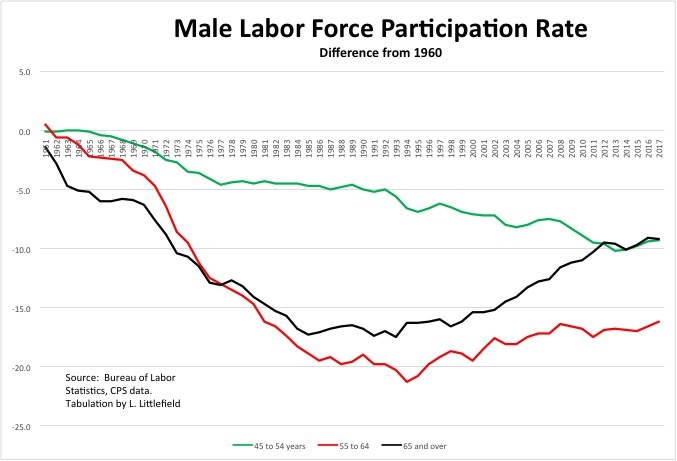 According to a 2024 projection by the U.S. Bureau of Labor Statistics, the older labor force will continue to grow. 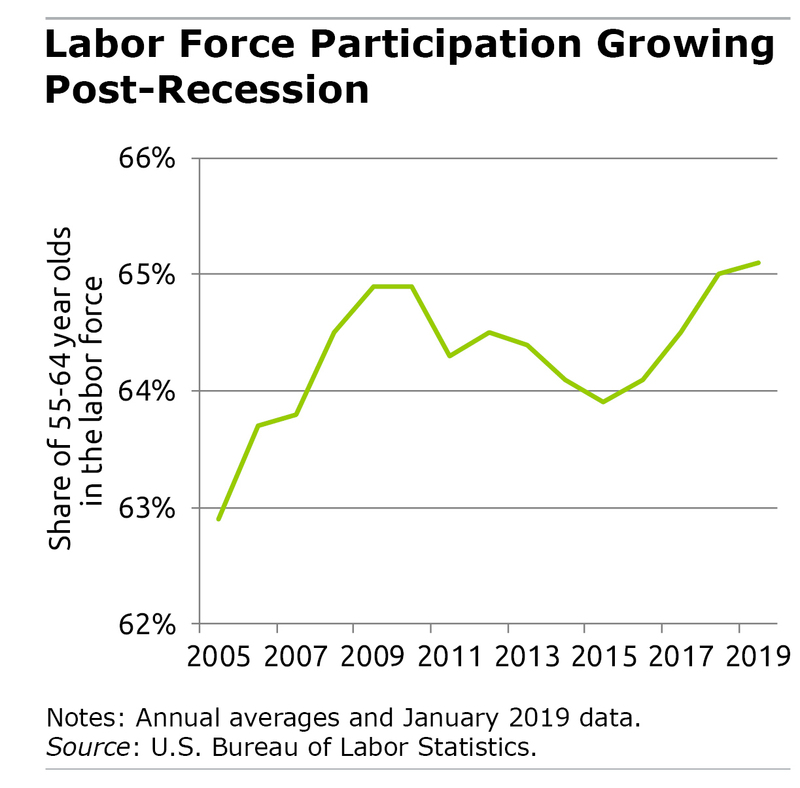 The biggest change will be among the oldest populations: a 4.5 percent increase in the number of 65- to 74-year olds in the labor force, and a 6.4 percent increase over age 75. Lately I’ve been hearing anecdotes that seem to back this up. One friend, a 65-year-old Texan, had been retired a year – until a golf buddy persuaded him to come to work for him. A Boston attorney I know is enjoying a slow-motion retirement from his firm – the partners keep finding things for him to do. Millions of decisions like these have increased the average retirement age significantly in recent decades. There is abundant research to explain this trend. Some boomers continue working so they can repair their finances before they retire. Longer careers are also more feasible for boomers, who are healthier and more educated than their parents and grandparents. Another statistic also points toward prolonged careers. Today, there are far more people over 65 working full-time than part-time. In the 1990s, part-time jobs dominated. Such dramatic changes in the nature and timing of retirement “would [not] have been envisioned a generation ago for the Golden Years,” concluded Adviser Perspectives, an online publication for financial professionals. It also puts less stress on Social Security systems and other government sponsored agencies that support older people. Ageism is alive and well in the workforce. My fulltime job with benefits was eliminated. I am an educated person with many years of experience in Administration and Nursing. I could find a nursing job for three days per week and I had to take Social Security earlier than when I had planned to. I was 63.5 years old then and will be 65 this coming September. Next year in 2020 will be my full retirement age year and I hope to try again for a full-time job. I do love my part-time job but I am limited in what I can make and I have to pay for health insurance too. Very frustrating, no benefits in part-time work. Heath insurance is increasingly expensive as you get older. Until Medicare covers it, and it’s free. I’ll bet they’ll be more interested in hiring you when you are 65. In fact, you can offer to freelance for higher cash. A longer term view shows that it is those who get Medicare, and were in already advantaged generations, whose labor force participation has really risen. Those now over 65. Chart here. My chart goes through 2017. Perhaps at this late date, businesses have been desperate enough to hire those age 55 to 64 in larger numbers — at least as freelancers without benefits, temps without benefits, or delivery drivers. Sure, if you already are on Medicare then a company does not have to offer health insurance at a great savings. Once I enter 2020 my full retirement year in which I will become 66, there will be no limits on how much income I earn and I will look for a full-time position just so I can save some more money for a while. I am in good health with no medications so it might work in my favor.